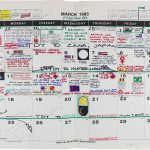 [Illustrated Cold War Current Event Calendars for 1981-87 and 1989.] 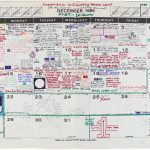 Leavenworth, Kansas, 1981-1987, 1989. 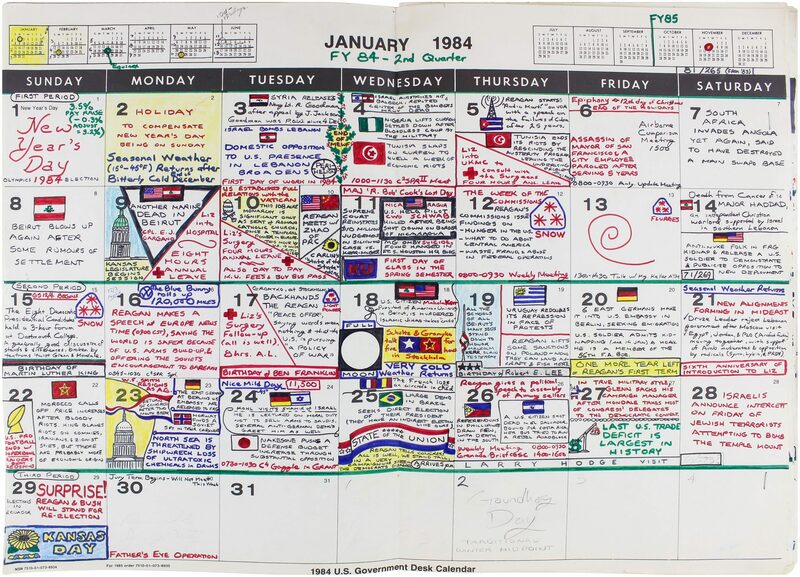 Collection of eight U.S. Government-issued desk calendars (each 16-17”h x 21 ¾-22”w when open), massively illustrated in pen, pencil and felt-tip pen, folded and bound into cardboard wrappers. 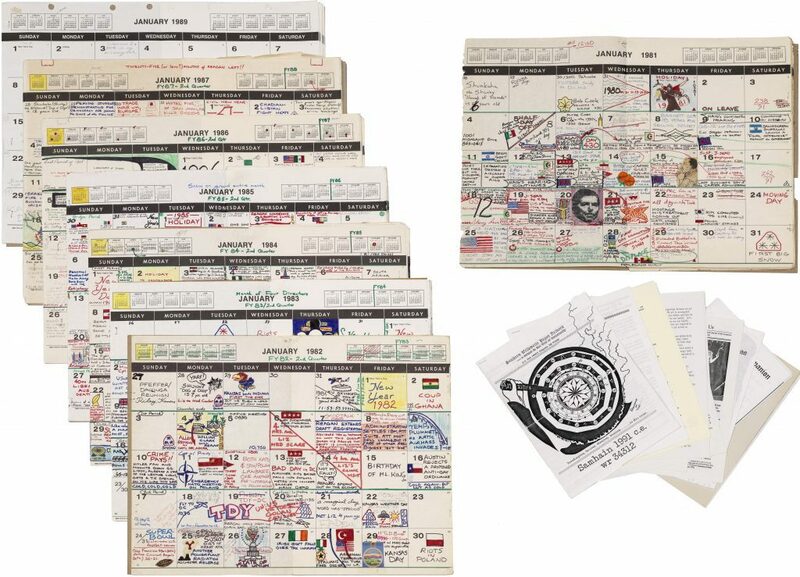 Folios. 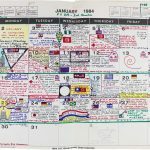 With a typed letter in draft and ten pieces of Pagan/Wiccan ephemera, mostly newsletters (some in paste-up form), apparently from the early 1990s. 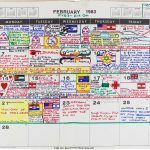 Collection of government-issue desk calendars, massively illustrated during the Cold War by a disenchanted Department of Defense employee with 1000s of images of personal, local, national and international significance. 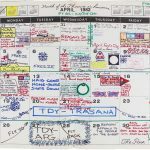 The illustrator was a mid-level (GS-11/12) civilian planner and operations officer/analyst who worked for the Department of Defense at the US Army’s Combined Arms Combat Development Activities (CACDA). 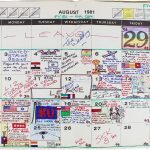 Apparently he retired after 1989, just before CACDA was downsized following the end of the Cold War. 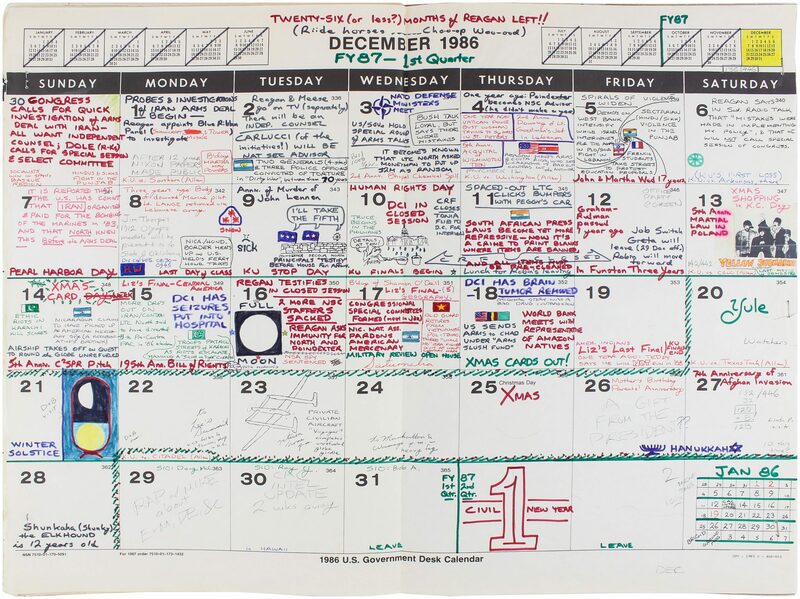 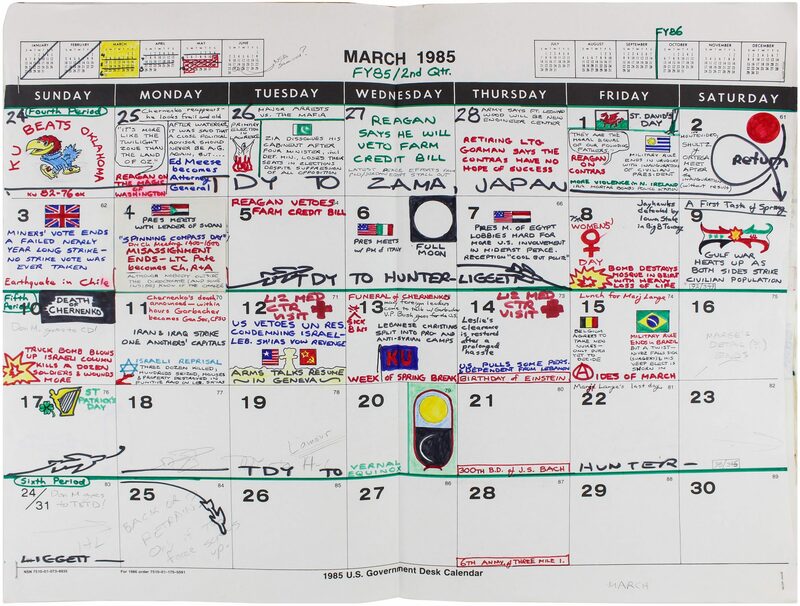 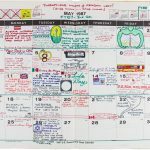 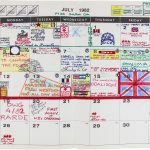 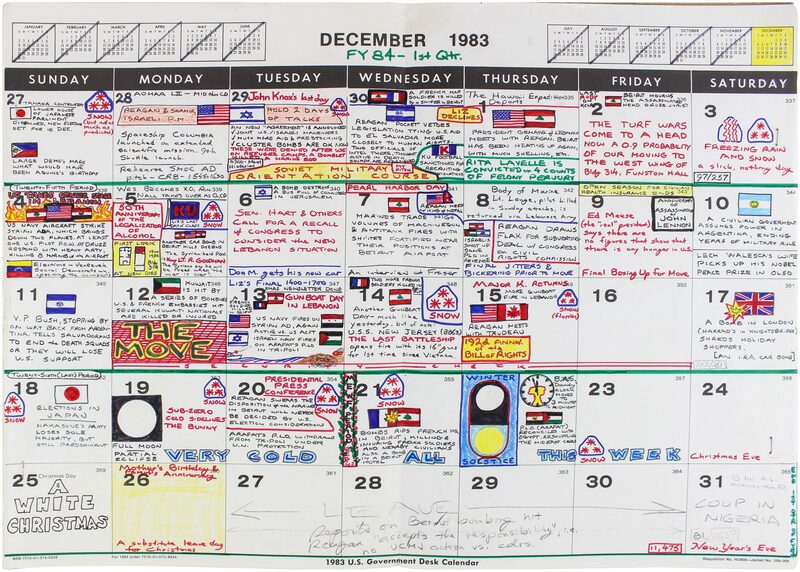 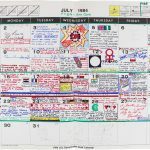 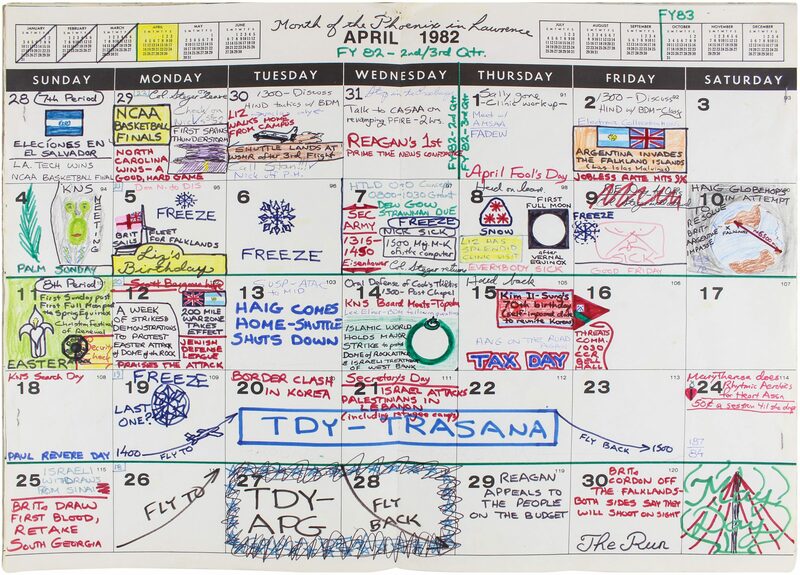 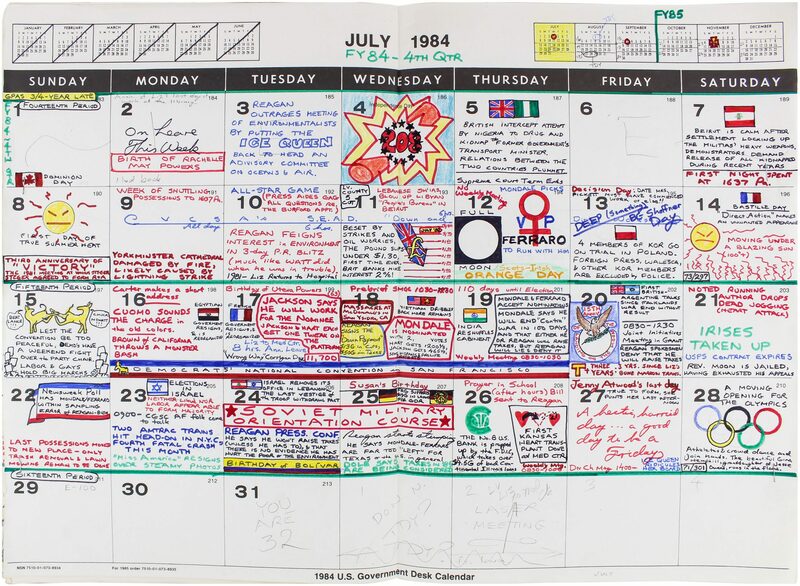 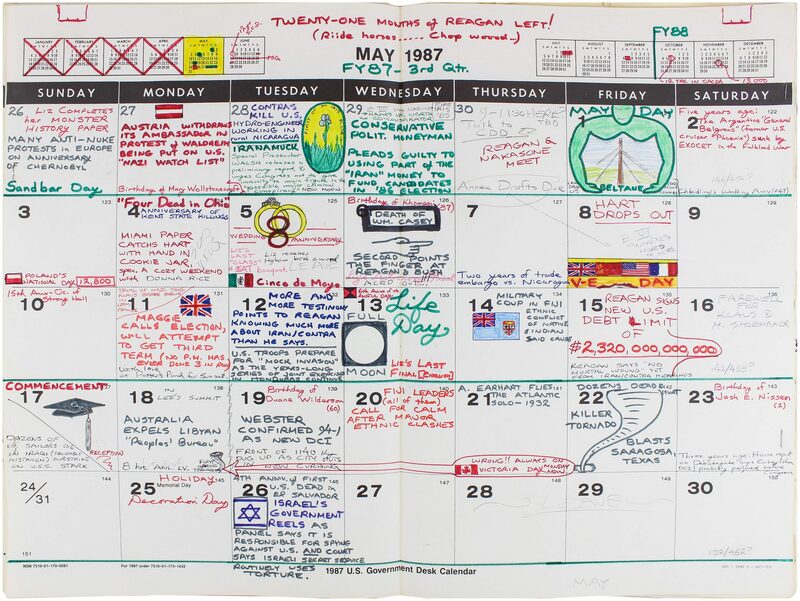 During the years 1981 though 1989 (the 1988 calendar not present), he adorned his desk calendars with lavishly-colored drawings and text, recording current events, pagan and other holidays, the weather, or matters of personal significance. 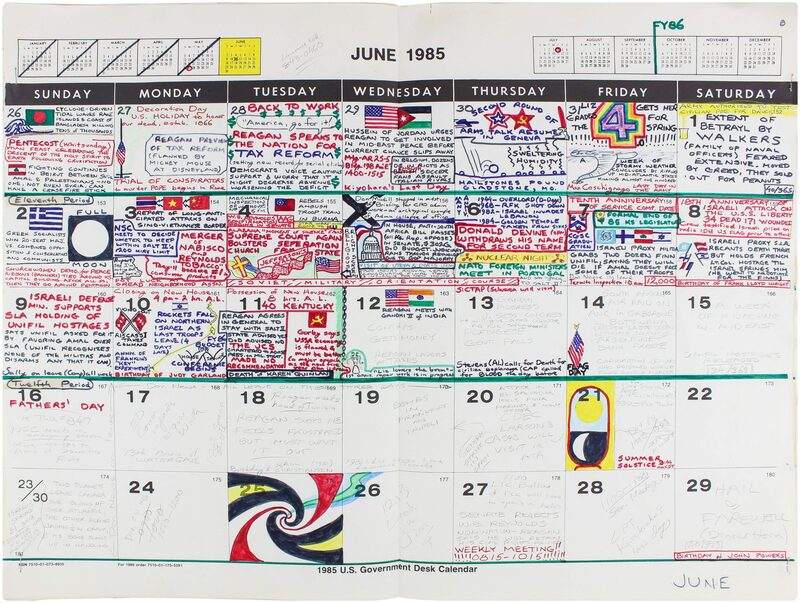 The drawings and use of color begin to trail off in 1986, but to the end nearly every day bears his records of and comments on events. 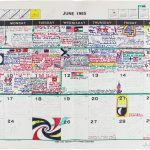 The political content is consistently interspersed with material of a more local and/or personal nature. 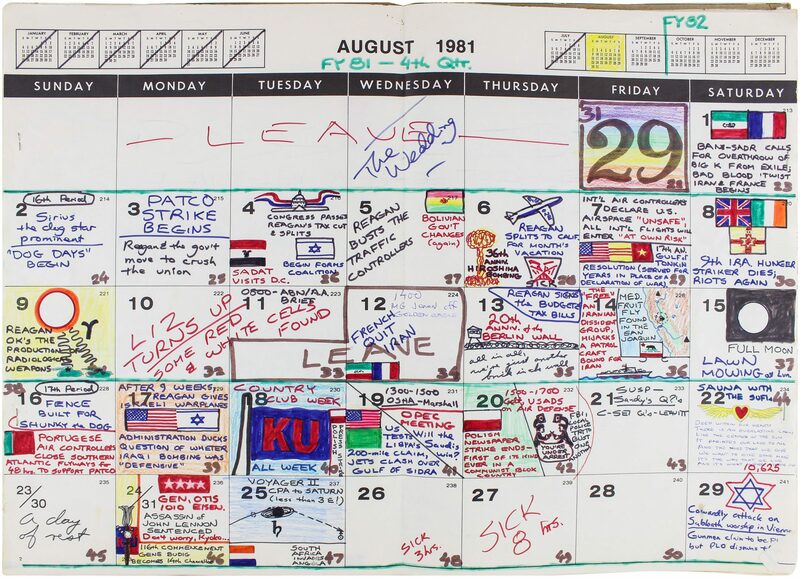 The weather and the changing seasons are a constant theme, as are goings on in his office and at nearby Kansas University, with a particular interest in athletic events. 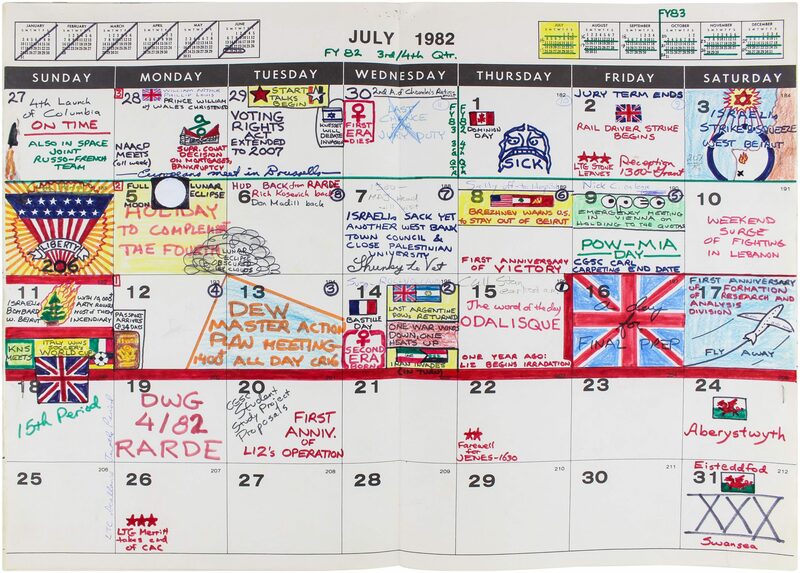 He also notes many sick days taken—occasioned perhaps by disgust and/or stress?—vacations, and even his occasional haircuts. 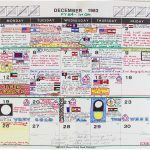 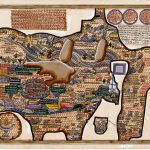 Notations of pagan holidays and the lunar calendar add further color to this remarkable visual record and provide a bridge to a small collection of pagan material that accompanies the calendars. 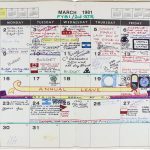 These pieces give a glimpse into a separate life in Oregon’s “Southern Williamette Pagan Network” and the “Lane County Pagan Network.” The newsletters, designed on what appears to be an early Apple Macintosh, themselves document the flowering of micro-community desktop publishing enabled by the graphic interface computers that presaged the coming of the World Wide Web. 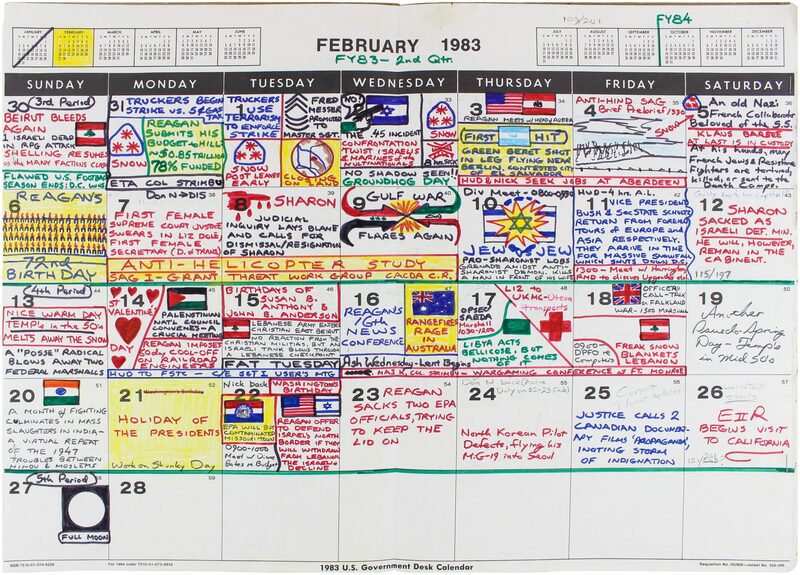 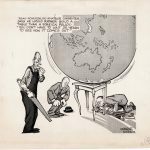 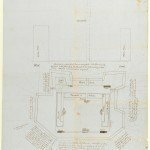 The sustained work of an able draftsman and cartoonist, these desk calendars offer a unique perspective of an individual who was both a government insider and an outsider to mainstream American society. 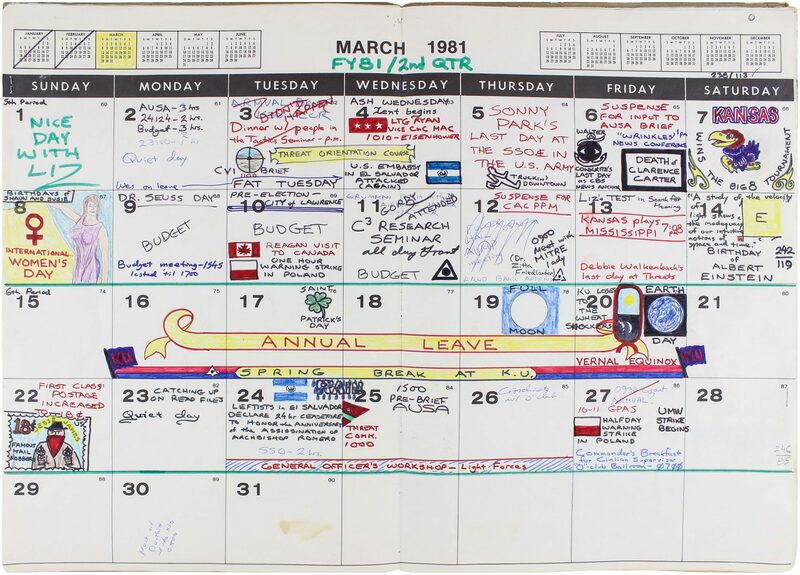 Calendars lightly worn in hand-bound cardboard wrappers, newsletters overall near fine.